A Nox Android emulator, with Kali and adb connected to it, which you prepared in previous projects. The host system can be either two PCs or one Mac. 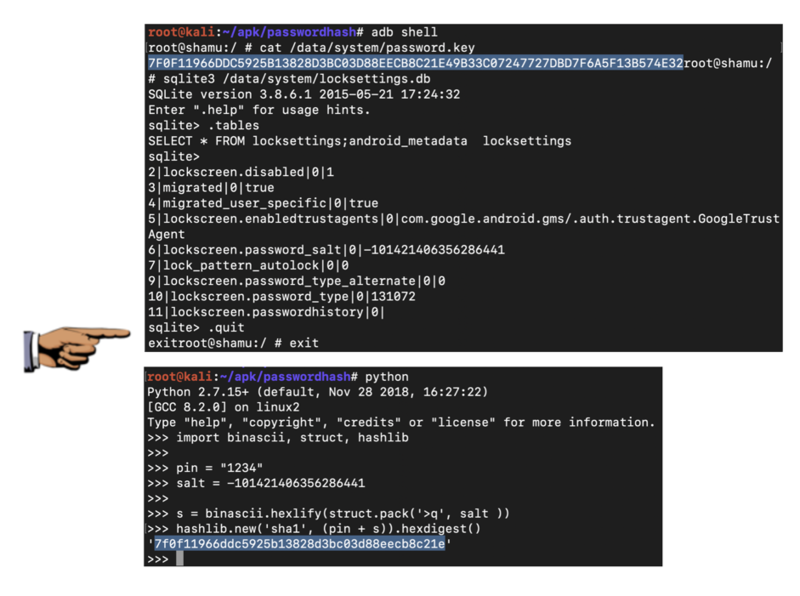 To recover a PIN from an Android 5 device. Don't use a more recent Android version or it won't work. Start Nox. If there is no PIN, Open Settings, Security, "Screen lock" and assign a PIN of 1234 as shown below. As you did in previous projects, connect to your Nox emulator from Kali, as shown below. You now have the password hash and salt. In the image below, the password hash is highlighted, and the salt is outlined in yellow. Find the two values on your system. You will need them below. 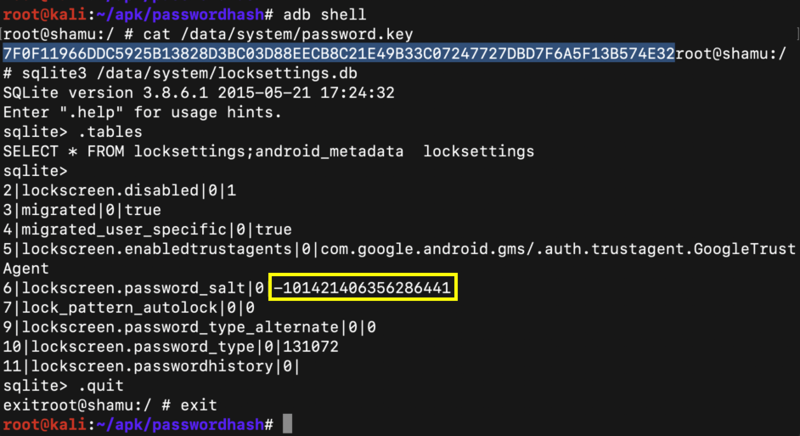 The SHA-1 hash you calculated in Python should match the first portion of the Android hash you found on the phone, as shown below. Put both Terminal windows on your desktop, as shown above. A long password hash, printed out from the password.key file, as shown in the top image above. A SHA-1 hash, computed in Python, as shown in the bottom image above. Save the image with the filename "YOUR NAME Proj 12x", replacing "YOUR NAME" with your real name. Include the PIN in the body of your email when turning this project in.